If your home was built back in the days when partitioning was a common interior design, it could be a great candidate for the popular trend of creating open space—to give the feeling the interior has more space than it really does. 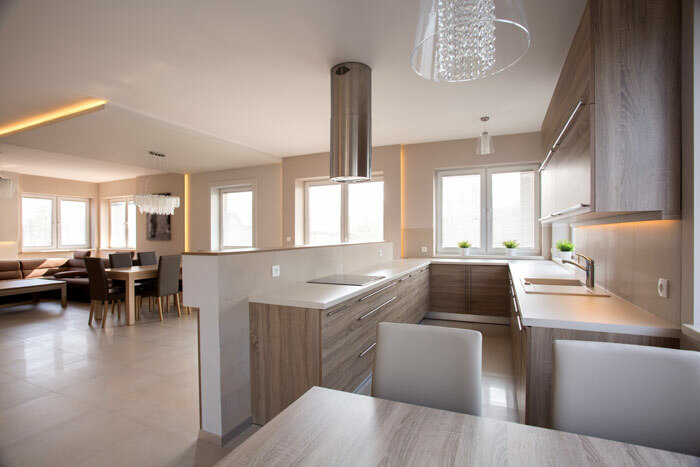 Here are some thought on why open-concept remodeling in Avon Lake and other communities is worth considering when adding a room may be cost- or space-prohibitive. Kitchens are popular areas for open-concept remodeling. By taking out a wall, it will add a feeling of spaciousness. Many homeowners over the years have chosen to remodel their bathrooms or refinish their hardwood floors. But when undertaking those projects, why not study how an open floor plan can make your renovation seemingly add space—and complement your home’s marketability? In the designs for older homes, compartmentalization was the rule. Kitchens were often designed with swinging doors at the entrance and exit. It was all about separating each room. Likely every room in those designs had a door—even pocket doors were the rage for a time—and closing off rooms was the rule. Kitchens are ranked top among the spaces homeowners want to convert into open areas. As preparing and enjoying food has become increasingly popular, the kitchen and dining room are clearly the heart of the home. A functional and flowing design of an open-concept kitchen creates a spacious area with workspace and dining areas that can accommodate nearly any home entertainment event—parties, holiday dinners and brunches, for instance. 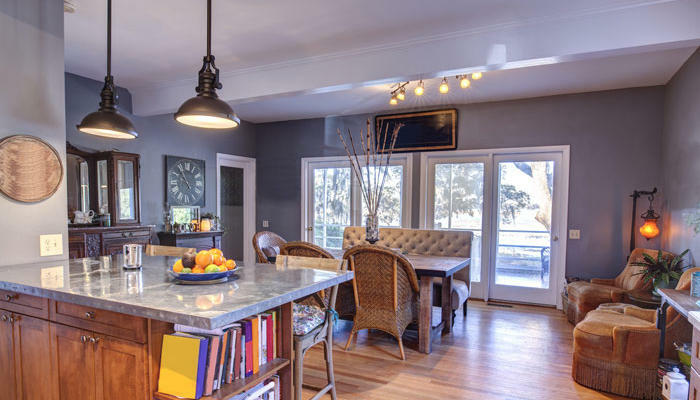 While you may want to start tearing down that wall between your dining room and kitchen right away, one of the prime concerns is the location of load-bearing walls. These give structural integrity to your home, and if you remove one to open a space, you weaken the support of the roof or second story. By installing a beam over a standard doorway, it will allow you to open an entranceway. 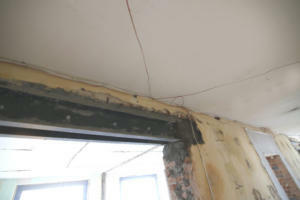 However, by installing a beam in the ceiling over the newly open area, the problem can be solved. Removing a load-bearing wall usually requires the services of a structural engineer to evaluate the plan, and the beam can be hidden in the ceiling or incorporated into the existing design. Partition walls do not bear weight and can be removed without affecting the structural integrity of the house. While they are an obvious candidate to eliminate, they may have wiring or plumbing within, making a simple removal more time-consuming, but none the less very doable. Another matter to consider is how bathrooms and stairwells will be positioned. If these are in the center of your proposed open area, moving them will add considerably to the cost. One alternative is to keep them as a closed center and incorporate open space around that core. A limited open space may work best for you. When you remove a wall, it opens the room but also the possibilities. One of the most popular designs creates a blend of an open kitchen-dining room-living room. The dining table would serve as a buffer between the kitchen area and the living room, and the airiness is still preserved for all three areas. This configuration makes it seem the interior is spacious and allows guests to move about without feeling cramped. Along the lines of an open-concept home, be aware that openness involves sharing activities in that space. For instance, when someone is working in the kitchen and those in the living room are watching TV, the activity and acoustics may need to be managed. One acoustics solution is to incorporate window treatments and floor coverings (soft carpets and the like) that will absorb sound and not take away from the open composition of the space. Dining rooms in older homes can be opened to give a feeling of spaciousness. Some homeowners may have a particular piece of furniture or a large oriental rug they would like to showcase in the new open-concept design. If you’ve been waiting to put that 84-inch sofa in its proper place, you’ll need to open the space around it. The same goes for that 9½- by 13½-foot Oriental rug you’ve been anxious to display. You’ll want to avoid TV and network cables running across the floor in your new open space. Electronics can be stored in a central closet or cabinet and wires can be run through ceilings and walls to make a seamless look. It also would be an opportune time to install an integrated control system to manage lighting, HVAC settings and perhaps a security system. Need some more advice on open-concept remodeling in Avon Lake? Getting started on your project is just a phone call away. With over 40 years of experience in construction and remodeling projects, Sciarappa Construction offers the highest level of proficiency, quality and efficiency to complete your project. Contact Sciarappa Construction at (440) 930-2882 or by email at info@sciarappaconstruction.com. We’re located at 32961 Pin Oak Pkwy., Avon Lake, OH 44012.